My pet peeve with Windows 7 and 2008R2 (and Windows 8) is the ‘thick’ taskbar. It takes way from desktop area real estate, especially when you have users that still insist on using a 1024×768 resolution. I work with a product that requires a minimum of 1024×768. In reality it should be any resolution higher than that because with you have the thick taskbar enabled by default the bottom of the windows get cut off. It also has hard to distinguish icons, and without the title next to the icon the end users can’t tell how many windows they have open or which one they are looking for. 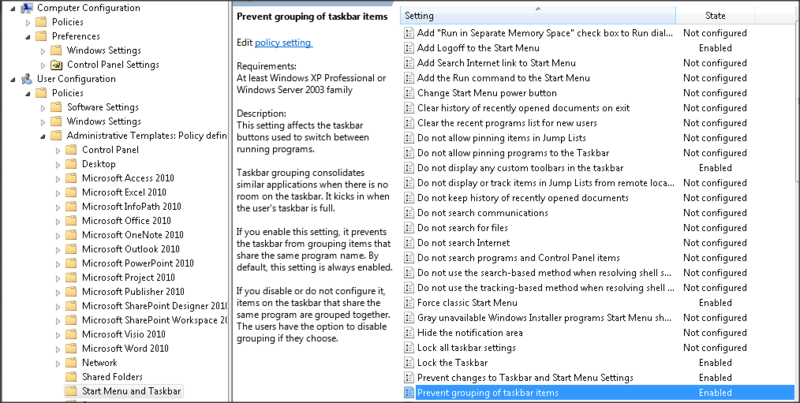 So here are the Group Policy changes you can make in your domain to have a clean taskbar on every desktop! 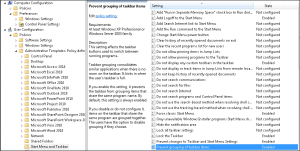 To start, enable the Group Policy Object to disable grouping of task bar icons. My preference is to create a new Group Policy Object called “Desktop Standardization” for this. 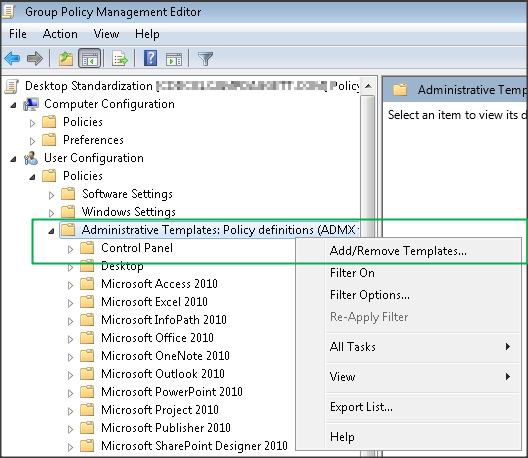 Next, we will create a custom template to create a group policy entry to turn on the “Use Small Icons”. There is not a GPO for this by default. The following was not created by me but found on two other (probably more) blogs out there. POLICY "Enable small icons on taskbar"
not enabled or disabled large icons will be used." 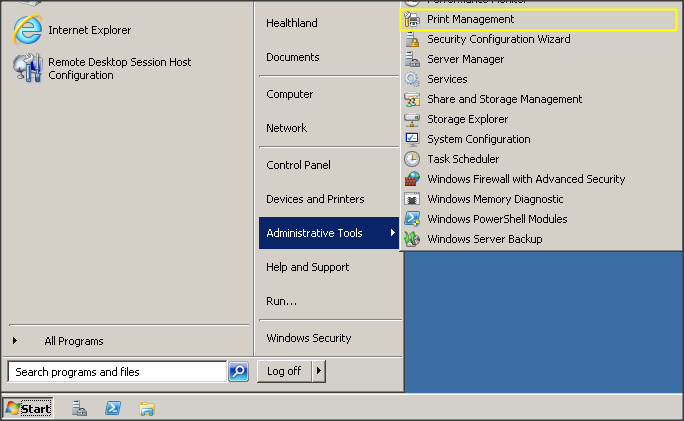 Launch Group Policy Management from your domain controller. Locate your “Group Policy Objects” and create a new object, or right click an existing one and click Edit. 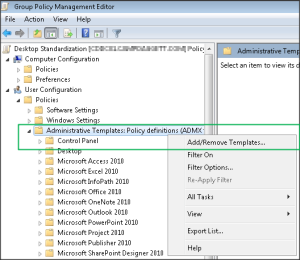 Expand out User Configuration -> Policies -> Administrative Templates. Right click on Administrative Templates and choose Add/Remove Templates. Browse to and select the .adm file you created in step 2. You should now the following ‘Classic Administrative Templates’ with Taskbar Extras. Enable the policy. Don’t forget to link your object if you did this in a new object! Enjoy your clean desktops and two less steps each time you deploy a new workstation or image. I wonder if saving the .adm files as .admx in step two would act differently? Bueller? You’ve installed your printer drivers, or if you haven’t check this post first. It’s now time to create the printers and share them out. Make sure your new printers are powered on and have static IP addresses assigned to them and have them plugged into the network. 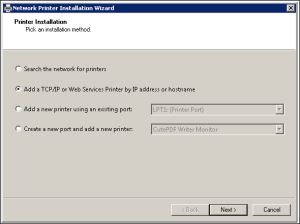 When you set up your printer queues on your print server you’ll be presented with a screen as shown below. Printer Name: The name you put here will only be seen by the System Administrator. 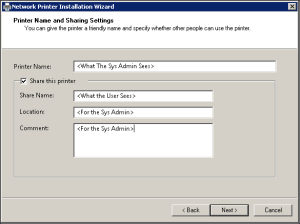 Share Name: This is the name the end user will see when the printer is installed on their workstation or if they browse the network for printers. This name should be the same as what you print on the sticker to put on the front of the printer. 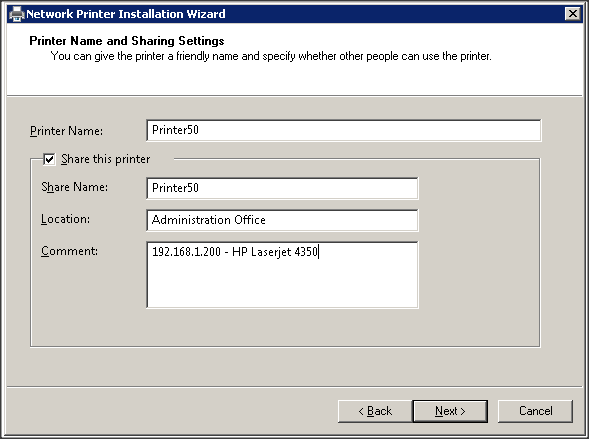 If you decide to name your HP LaserJet 4350 in the billing office “Printer20” then the share name should be “Printer20”. Location: You want to use this field. * Be descriptive, if the printer is in the Billing Office Room 4, put that in this field. You will be able to see this column from the print management tool. Also users can see it if they add the “Location” column to their Windows Explorer view. *Note: If you change the printer location field later, because you’ve moved the printer elsewhere, you may need to delete the printer queue on the local workstations and then re-add the printer. Time to add some print queues. 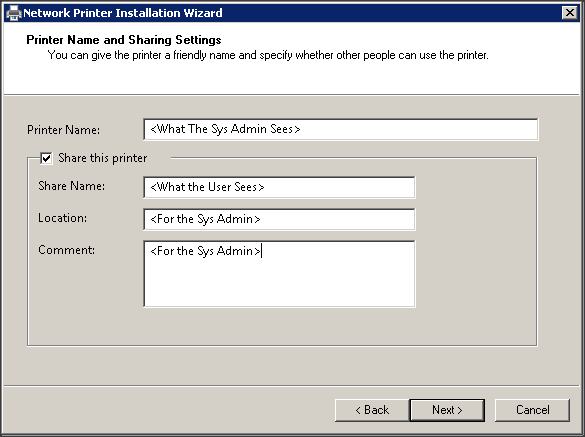 Expand out Print Server -> [YourHostname] (Local) -> Printers. You’ll see any printers already installed, the the XPS Writer. Right click on Printers and click Add Printer. 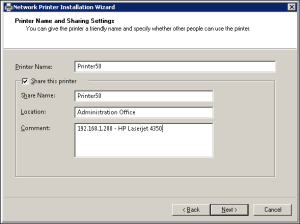 Hopefully the printer you are sharing has an IP Address assigned to it already (And that it’s a static IP!). We’ll go through adding the new IP Port. 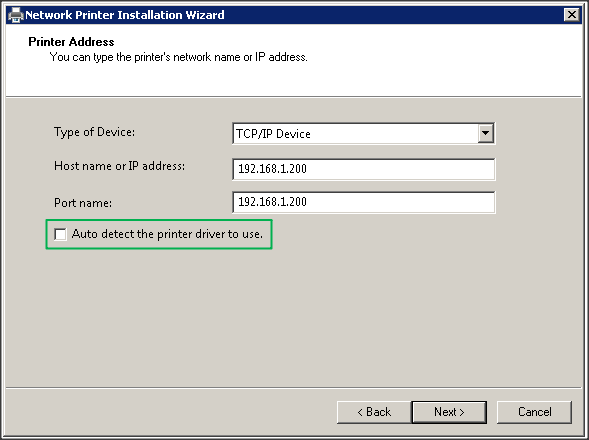 Printer Address: Select the type of device, generally it is a TCP/IP Device. Selecting this speeds up the next process. 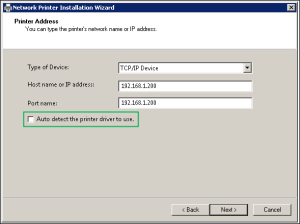 Enter your IP address that is assigned to the printer. Then uncheck the box to autodetect the printer, this will also speed up the process, because hopefully you’ve already added your 32 and 64bit drivers. Then click Next. Allow the next step to complete while the server searches for the printer. It is best to do this process when the printer is powered on and plugged into the network. Click Next on the screen regarding Additional Port information. Generally leaving “Generic Network Card” is acceptable, if you have an HP JetDirect, then you can choose that option if it was not already detected. Zebra printers, for example, just use Generic Network Card. Once done here, click Next. 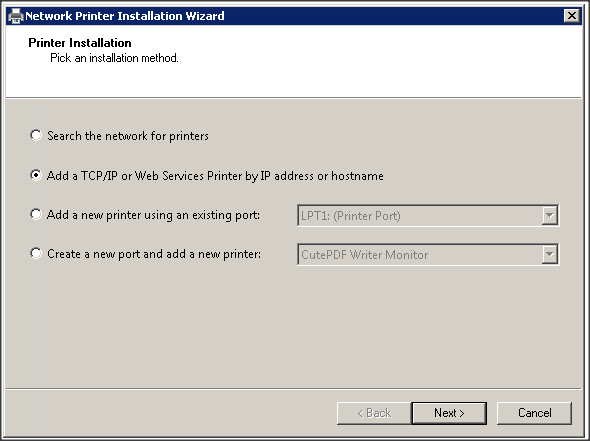 If your printer is not powered on and plugged into the network, this step will take a few minutes to complete. Select the existing driver you’ve already installed. If you are adding a new printer now, you will need to go back to Drivers and add the 32bit or 64bit driver if needed. I cancelling the install here and adding your drivers first before proceeding as sometimes the process can crash. Click Next when done. Enter your very easy to understand printer naming convention and printer information, and then click Next. Click Finish and test your new print queue. Next test installing the printer on a few workstations.